The Sharkadina Blog: Go Shark Yourself Contest! You can go create your own Roger Bernadina Shark photo and send it to us via Twitter, Facebook, or email. We'll feature the best Sharkafied photos on our blog during Shark Week, starting Aug. 12. While we prefer photos of Bernadina, we would accept photos of other Nats players, Shark fans, or other people nicknamed "The Shark," like umpire Chris Guccione, who was nickamed by Mark Grace during the epic May 3 Nats vs. Diamondbacks games where we featured extensively on FSN. Oh by the way, Roger Bernadina continues to dominate offensively, and everyone is talking about it. 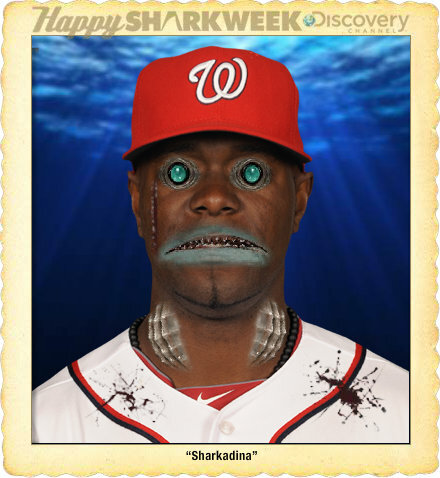 From The Nats Blog's post "Shark Week Comes Early in DC:"
After batting a measly .241 with a .325 OBP in 124 plate appearance during the first three months of the season, he has since batted an insane .482 with 14 hits in 29 at-bats. He has also doubled his number of stolen bases while only getting caught once. This has moved his season totals to a very respectable .292 average, .372 OBP, 11 steals, and 17 runs batted in along with zero errors. Thanks for the link to my article! As you can tell, I'm very glad the shark is performing the way I've always hoped he would.